“Blessed are the dead who die in the Lord . ., that they may rest from their labours; and their works do follow them.” Revelation 14:13. Elder Cruise went to sleep on Monday, October 10, 1994 and we remember him through his devotion to Christ! This falsehood has gained such strength that multitudes of Christians call this the “Jewish Sabbath.” But nowhere do we find such an expression in the Bible. It is called “the sabbath of the Lord,” but never “the sabbath of the Jew.” (Exodus 20:10). Luke was a Gentile writer of the New Testament and often referred to things that were peculiarly Jewish. He spoke of the “nation of the Jews,” “the people of the Jews,” “the land of the Jews,” and the “synagogue of the Jews” (Acts 10:22;12:11; 10:39; 14:1). But please note that Luke never referred to the “sabbath of the Jews,” although he mentioned the Sabbath repeatedly. Yes. The law was nailed to the cross. But which law? There were five sets of laws in effect before the cross. There was natural law, civil law, dietary law, the moral law and the Law of Moses. natural laws, which govern the physical things such as gravity, weather, the paths followed by the planets, etc. dietary laws regarding health, and when those laws were violated, disease and death were the result. Jesus did not nail natural law to the cross, since we still have gravity, weather, etc. He certainly did not nail civil law to the cross; as such laws are needed to protect citizens from the behavior of others. They are needed in any civilized society. It could not have been health laws since disease usually results from transgressing health principles. 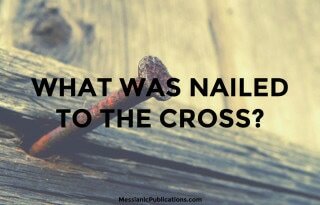 So what did Jesus nail to the cross? Could it have been the Ten Commandments? I will explain why it could not have been the Ten Commandments. Do you believe that Jesus was the Creator God? Do you believe it was He who on Mt. Sinai wrote the Ten Commandments in stone with His own finger? It was a reflection of the very character of God and it was not to change or be changed. Psalm 111:7,8 “The works of his hands are verity and judgment; all his commandments are sure. They stand fast for ever and ever”. Now I would like to ask you. Do you believe God’s works stand fast forever? Now listen closely friends, Jesus Himself said in Matthew 5:17 “Think not that I am come to destroy the law, or the prophets: I am not come to destroy, but to fulfil.” And fulfill the righteous requirements of the law is exactly what He did, leaving us a perfect example to follow. Jesus made it very clear about the perpetuity of the Ten Commandments. Heaven and earth have not yet passed have they? No, so by the words of Jesus, those Ten Commandments are still in effect, and God has never changed them. To be called the least in heaven means that the person will not be there. Friends we have to be very careful of the position we take in regards to the Ten Commandments as such persons who speak against them, are actually an enemy of God. Be sure your preacher stands firmly on all Ten Commandments. Paul stated the importance of the Ten Commandments in Rom. 7:7 “What shall we say then? is the law sin? God forbid. Nay, I had not known sin, but by the law: for I had not known lust, except the law had said, Thou shalt not covet.” That is the tenth commandment. Friends on the authority of God’s Word, if we are not keeping God’s Ten Commandments, the Bible says that we are a liar and my Bible tells me liars are lost. John said above, “He that saith, I know him, and keepeth not his commandments, is a liar…” Revelation says liars will not have access to the tree of life. This is serious business friends and we have to be so careful that no man steals our crown, Revelation 3:11. We have to study for ourselves and I will give you keys, to unlock Scriptures week after week so you will not be confused. Remember most importantly, no one will keep the Ten Commandments in order to be saved; rather they will keep them because they are saved. Saved by grace through faith in what Jesus did for us. But grace does not excuse obedience. God makes that very clear. All right, so one thing is very clear and that is that Jesus did not nail the Ten Commandments to the cross. That leaves only the Law of Moses that pertained to religious ceremonies and sacrificial offerings. The Bible interprets itself and should never be explained with faulty human reasoning. We will now look closely at the wording and explanation of these verses in the light of scripture. First the word ordinances. Both of these scriptures refer to the commandments that were contained in ordinances. Ordinances, as applied in scripture, are requirements regarding religious festivals, feasts and sacrificial offerings. There are no such ordinances in the Ten Commandments, which were written with the finger of God on stone. The words “ordinances that was against us, which was contrary to us.” There is nothing in the Ten Commandments that was either against us or contrary to us. So what was against us? Deut 31:26 “Take this book of the law, and put it in the side of the ark of the covenant of the LORD your God, that it may be there for a witness against thee.” It was the handwritten book of the Law of Moses placed in the side of the ark, showing it was temporary in nature and at some time in the future, they would no longer be necessary. But as far as God’s moral law, the Ten Commandments, they were placed in the ark, showing its permanence. You can find that in Deuteronomy. 10:1-5. “At that time the Lord said unto me, Hew thee two tables of stone like unto the first, and come up unto me into the mount, and make thee an ark of wood. There were Jewish Christians that were always trying to get the Gentile converts to keep the ceremonial laws. Paul was constantly trying to repair the damage. In Galatians it was primarily over circumcision. But here it was regarding the meat and drink offerings as well as trying to get them to keep the seven yearly ceremonial sabbath days found in Leviticus 23:4-34, which include Passover, the Feast of Unleavened Bread, the Feast of First Fruits, the Feast of Weeks (which was called Pentecost in the New Testament), the Feast of Trumpets (Rosh Hashanah), the Day of Atonement (Yom Kippur) and the Feast of Tabernacles or Ingathering. “Let no man therefore judge you in meat, or in drink,” The meat and drink offering is found in Leviticus 23:13. And by the way, the word meat was not speaking of flesh food at all. The meat offering was a fine flour from grains (meal) mingled with oil. The drink offering was wine. In Numbers chapters 28 & 29 Meat or meal offerings are mentioned 32 times and drink offerings are mentioned 27 times. Paul’s message was two-fold. To the Jewish Christians: If you want to continue keeping the law that was nailed to the cross, stop judging the Gentile Christians, who know it was done away with. And to the Gentiles: Stop judging those who persist in keeping the old ceremonial law. This whole controversy that Paul was dealing with was over judging. The fact is, judging is not the work of a Christian, then or even now. And finally verse 17. “…Which are a shadow of things to come…” Just about everything found in the ceremonial Law of Moses pointed to Jesus and His ministry, the cross and the resurrection. For example, the Passover pointed to Jesus the Passover lamb, Jesus died on the Passover, He was in the tomb on the first day of the Feast of Unleavened Bread, and He was resurrected on the first day of the Feast of the First fruits, which Jesus was the first fruits of the resurrected ones. They were the shadow of things to come. In each case type met anti-type in Jesus. The shadow met the substance. Jesus was the substance and when He came and finished His work on earth, the shadow ended. Do you see folks; this verse had nothing to do with food or God’s Seventh Day Sabbath. It was all about Jewish Christians and Gentile Christians judging each other about keeping or not keeping the old Law of Moses that ended at the cross. And that is clear. His commandments are a transcript of His character. They are His wisdom. And when we look more closely at them they come alive for us. In fact they become His Ten Laws of Liberty. So from tomorrow we will begin studying each Commandment exploring their profound meanings and importance for our relationship with Him.